I wanted to work in Africa since long before I retired. Vincentian Lay Missionaries allowed me to succeed in this ambition. Many organisations required volunteers to make a one to two year commitment which my own family circumstances wouldn’t have allowed me to. In October 2016 I happily began an eight week adventure with VLM by travelling to Ethiopia. I was full of curiosity about this country, which had not ever been colonised. 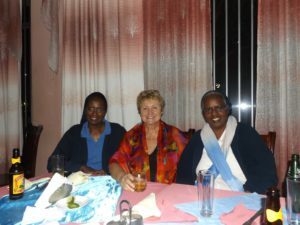 I spent time in Addis Ababa with the Daughters of Charity of St Vincent de Paul in St. Mary’s and then I flew down to my Woylita, Soddo in the south west of the country. I taught for six weeks in Bruh Tesfa Montessori College. Everyone was so helpful and so welcoming. The students were an absolute joy and I called on all of my teaching experience. I am looking forward to going to Ethiopia again as I feel I have real friends there and I felt safe at all times. I would urge any retired person to take this opportunity to do something wonderful, different and rewarding! VLM will be at the 50 Plus Expo! Is the weather very hot?